Where did the month even go? I swear I feel like I blinked and we are now on the last days of September. This was definitely a great month for so many reasons from going to Disneyland twice this month. We were able to spend mine and Rudy's birthday there along with celebrating Halloween a little early. It has now turned into a tradition of ours to spend our birthday's at Disneyland. Lots of wonderful memories were definitely made this month for sure with making this month even more special always. 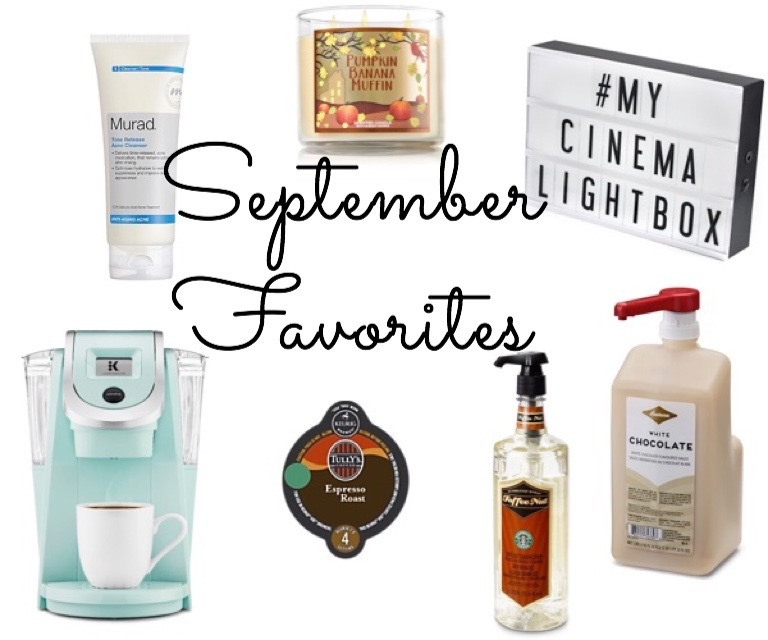 With a great month passing by us I have some favorites to share. I was so excited when I first ordered my own cinema light box and I couldn't wait to get it in the mail! I've seen a lot of shops on Instagram using them in many different way and I thought it would be a lot of fun to use for blog purposes and just for fun. I purchased my light box from My Cinema Lightbox and on their website you can choose from the mini box which is what I went with to the XL box. The boxes already come with 85 letters and symbols and I really appreciated that they give you more quantity of the more popular letters such as the A's, E's and O's. On their website they do also offer extra letters and colored letters for separate purchase. I have this cute little box set up on my desk with my name on it, Ohhjuliana. I love looking at it and lighting it up. The light from this box is very bright which is great. I was so excited to use and share it for the first time for my blog giveaway and I look forward to use it more in the future. I do wish that they offered more varieties of fonts and maybe holiday themes. I would love it they even added some Disney Characters and symbols. During my trip to Disneyland early this month I made my way into Sephora to purchase a new face wash. I love my Purity facial cleanser and it really gets the job done. However that is all it does and I wanted something that did more. I wanted something that would help with acne since I get a couple of break outs here and there mainly around that time of the month. The Time Release Acne Cleanser by Murad aught my eye but I and I continued to do some research on other cleansers I was eyeing. My friend Jessica texted me one day and she recommended this exact cleanser from Murad. She uses it herself and loves it so I was sold. I began using it the day I purchased it and towards the end of my trip I began to notice I was breaking out on my chin and neck. I couldn't figure out why or what was causing this since I hadn't eaten anything bad while at Disney. I couldn't pin point the cause and then Jessica mentioned maybe my skin was purging from the face wash. I continued to use it every night and now about three or four weeks later my skin is back to normal. I think my skin was purging which was a something I wasn't expecting at all but I am glad I stuck through it. My skin is so much more clear than before and I think it has even helped with some post acne scars I had. I've also noticed that I'm not breaking out like I would specifically during that monthly visit. I love the minty fresh feeling this cleanser leaves on my face once I am finished washing it. It is so refreshing and makes my face feel very clean. If you noticed the name of the cleanser 'time release' that is because this is also an anti-aging cleanser. This was another thing that sold me, not only does it help with acne but it also helps restore your youthfulness. It also doesn't dry out your skin. The only down side to this cleanser which is more of a personal preference is that it doesn't foam up. I like washes that foam up but I can definitely look past this with this cleanser. I can already tell this is holy grail status for me. This next favorite I can already see it being a lifelong favorite. I mentioned on a previous post that I had been really into coffee and wanted to invest in a coffee machine so that I could save money instead of going to Starbucks so often. Rudy and I finally did that and bought this gorgeous Keurig 2.0 Coffee Maker Brewing System in the color Oasis. This shade is exclusively sold at Target and it was a bit of a hassle to get. When I saw this shade months ago with Imelda we were both drooling over it. At the time I had no interest in owning it and maybe a month later was when I started to get a lot more into coffee. I then began looking into getting my own coffee machine. An espresso machine was what I was first looking for but a Keurig you have endless amounts of brewing options. With a Keurig I am be able to brew myself a single cup of coffee and now with this newer model it allows you to brew a carafe which serves up to three to four cups. This 2.0 model is perfect for entertaining guests and gives you so many options from the ounces you can to brew, if you want your coffee to be strong, and like I mentioned you can now brew a pot. I can't forget to mention the never ending amount of coffee flavors to choose from which brings me to my next favorite. I have been brewing this Tullys Espresso Blend coffee with my Keurig. On the Keurig website I saw this coffee or 'espresso' was described as a chocolate caramel taste which is the same as the espresso from Starbucks. My intentions when buying this coffee machine was to try and replicate the iced white chocolate mocha drink from Starbucks that I am obsessed with and they add espresso. I'm not sure if it tastes identical to Starbucks but it is definitely pretty close and this coffee is delicious. With that I also bought the Fontana White Chocolate Sauce from Starbucks to help me achieve that. In my white mocha I love to add a couple pumps of Toffee Nut Syrup so I also purchased it to create my own cup of iced coffee at home. This has made making my own coffee at home so much fun and has also really helped save money of course. My coffee taste almost exactly like Starbucks and I have really been enjoying it. I have been telling my friends who are Starbucks drinkers to buy the syrups from Starbucks and make their coffee at home. Like I said it saves a lot of money and time. Plus you can get creative with your coffee and become a home Barista haha! Lastly for my final favorite of the month is a candle from Bath and Body Works. This is one of their newest candles that was recently released with their Fall collection. One day while I was browsing through the store I came across this Pumpkin Banana Muffin candle and I was immediately obsessed. Ever since that day I had been eyeing it and finally purchased it about two weeks ago. I am so in love with this candle the scent is spot on. The first time I smelled it clearly it reminded me of banana bread and as soon as I got home I asked my dad to make some haha. It's not too sweet or over powering because I do not like those types of candles and it burns so well. Imelda told me it made her whole house smell as if she were baking banana bread and it truly does! Even the cashier at B&BW told me the same thing. This is a candle I will definitely have to stock up on it is just perfect for the fall season. I may even have to include this in my favorite fall candles. If you are inside a B&BW make sure to pick up this candle. 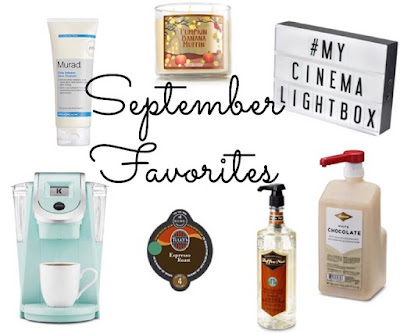 Ohhh I can't wait to see your favorites this month ;) I want to get more flavored syrups too! That coffee machine is everything such a stunning color. Thank you I love it so much.